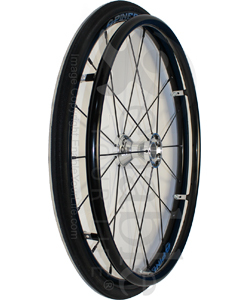 Choose Option 1: Hub Width 1.8" Hub Width 2.3"
Extremely reliable and comfortable for your everyday needs. Very quiet rolling wheels (no spoke creaking). Ultra lightweight and attractive design. Minimal maintenance required. Spinergy engineers have invented a revolutionary technology for stronger, lighter and faster wheels. Introducing PBO Fiber Spoke Technology. Every PBO spoke contains over 30,000 strands of polyphenylene bensobisoxazole fiber, delivering 3-times the strength of stainless steel at just half the weight. The PBO fiber strands are encased in a chemical resistant, water / UV proof composite offered in a variety of colors. The outcome is a flexible spoke with incredible strength that will absorb impact more efficiently while staying in true. Our patented PBO spokes are lighter than traditional steel spokes which results in less rotational weight and a faster responding wheel giving you the ultimate edge. All this delivers a wheel that is lighter, stronger, faster and superior in every way. Purchase Note: Most TiLite and Invacare chairs take the narrow hub while Quickie, Colours, and Kushall take the wider hub. Need help in determining which hub width to purchase? Email or call us with your make and model of chair and whether or not you are using quick release axles.